If you are looking for a more economical approach to protect your blower, our AN140T and AN140W models with Inlet Cap are the answer. These air cleaners are designed as pressure only, single stage, high air flow design that will protect your blower and keep it running clean. If you need a pressure/vacuum design in this configuration, we have an answer for that, too. 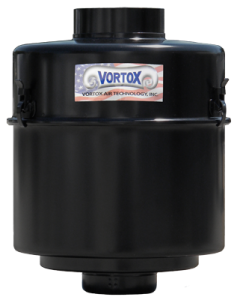 Simply remove the Inlet Cap and use a Vortox Air Technology 21327 adapter that fits the 6″ air cleaner OD inlet and has a 4″NPT Camlock fitting to accept the hose from the trailer. Both AN140T and AN140W can be mounted using Vortox Air Technology BB140 Band Brackets. Together with our CL14060 or CS600 Inlet Cap, this combination can answer a variety of needs. Constructed of 16 and 20 gauge Electro Galvanized Steel and finished with a durable polyester powder coat paint, the AN140T and AN140W will provide years of service for many applications. The outer housing is constructed using Deep Draw Technology which ensures a seamless, one-piece construction of the body and head components.